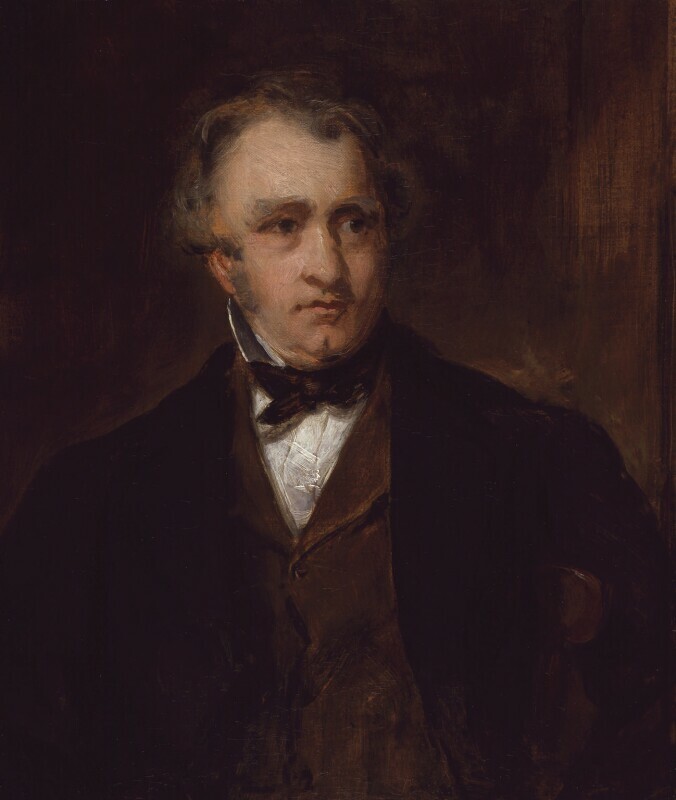 In a letter of 7 May 1877 (NPG archives), Grant wrote: 'The small picture is the original design for the life size head painted for the late Speaker. But I always thought this small picture the best likeness of the two.' The finished portrait is listed in Grant's 'Sitters Book', under the year 1853, exhibited RA, 1854 (69), and SKM, 1868 (463), lent by its original owner, the Rt Hon J. E. Denison, later Viscount Ossington. It was engraved by J. Paed (example in NPG). Macaulay records several sittings for the portrait in his 'Journal' (Trinity College, Cambridge) for May and June 1853; he thought the finished work 'excellent'. Correspondence from the artist, Stirling-Maxwell and others relating to the portrait and its purchase is in the NPG archives. After buying the portrait, Stirling-Maxwell asked to keep it for a short time in order to have it copied. On his death in January 1878 it was still in his possession, and did not enter the collection until October 1880. Sir F. Grant, 'Sitters Book' (copy of original MS, NPG archives). Brown eyes, grey hair. Dressed in a dark stock, white shirt, brown waistcoat and black coat. Seated in a wooden chair. Background colour brown. The artist; purchased from the Grosvenor Gallery Exhibition of 1877 by Sir William Stirling-Maxwell, Bart, and presented by him, 1877. Summer Exhibition, Grosvenor Gallery, 1877 (48); Centenary Exhibition, Royal Institute of Chartered Surveyors, 1968. J. Steegman, 'Sir Francis Grant, P.R.A. : The Artist in High Society', Apollo, LXXIX (1964), 485.